Direct from Spain, Ivan Vargas Heredia and Emilio Ochando meet centre stage in a duel of fancy footwork and fiery passion. Kasandra “La China” performs a subtle, evocative solo that ends with the two men meeting her on stage and all three present a frenzied interplay of emotion to open La Tarara. 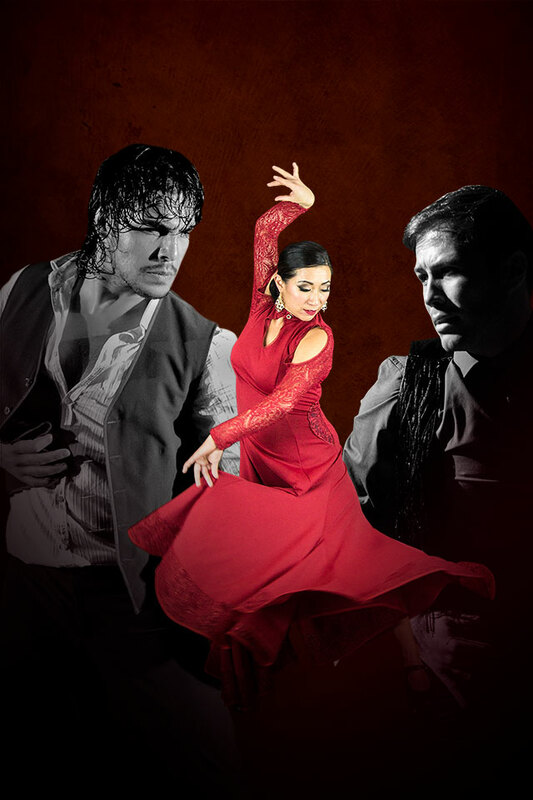 Live music is the other half of flamenco, and the extremely talented musicians, including musical director Gaspar Rodriguez, singer Vicente Griego “El Cartucho,” Cyrena “La Sirena” on Cello, and Davide Sampaolo on Cajon and Percussion, were in constant dialogue with the dancers. Their “flamenco chat” was a wonderful demonstration of how the music and movement work together to create flamenco rhythms. There were a few scenes that bordered on cheesy as Ivan and Emilio pretended to fight over Kasandra, but there were also some very humorous moments among them. Another notable scene involved Vicente giving Kasandra props to dance with, including fans that were increasingly large and ornate. Emilio’s solos with castanets and with a fringed cape that he manipulated with precision were very impressive, as was Ivan’s dancing with the flamenco cane. In Kasandra’s final solo, she evoked Carmen Sandiego, all in red with a flowing, fringed dress, wide brimmed hat, and mysterious air about her. Ivan and Emilio presented their own unique styles of flamenco. Ivan represented Flamenco Puro, while Emilio, who dances with the Spanish National Ballet, represented a more contemporary style with his training in classical Spanish dance. It was wonderful to see their styles interact and see the diversity of the flamenco form displayed throughout the evening.